Oak trees are largely planted as ornamentals. When they are afflicted by disease, they lose all of their aesthetic appeal. Several oak tree diseases are caused by fungi. Some are easy to spot and cover the oak tree's leaves or bark. Others are too small to be seen by the naked eye or operate on the interior of the tree. Most oak tree fungal diseases are easily treated by pruning the tree's foliage or spraying it with fungicide. Prune oak trees afflicted with anthracnose (leaves with small brown spots or large blotches along their veins that look scorched). Immediately remove infected leaf litter and pull off any afflicted leaves. Prevent an outbreak the next year by spraying the trees with a fungicide approved for use on anthracnose oak trees that contains mancozeb (e.g. Manzate 200, Dithane M-45). Follow the manufacturer's instructions and spray the leaves at budswell and then twice more at two-week intervals. Collect and dispose of all leaves and leaf litter that have been afflicted by powdery mildew (leaves that are covered with a powder-like fungus). Fungicide is often unnecessary. If you must spray, look for a fungicide that contains sulfur, fenarimol, dinocap, triadimifon or benomyl. Follow the manufacturer's instructions for application methods, times and amounts. Inspect your tree regularly for signs of oak root fungus. Once this disease progresses, it can be lethal. Signs of oak root fungus include slowed growth, callus formation over tree wounds, cankers that ooze sap, cracked bark and thinning of the tree's crown. If oak root fungus is identified, remove the soil from around the root crown to expose and dry out its roots. Oak root fungus almost exclusively attacks oak trees that are under cultural stress. Identify the cause of your oak tree's stress with the help of a professional arborist, and correct it accordingly. 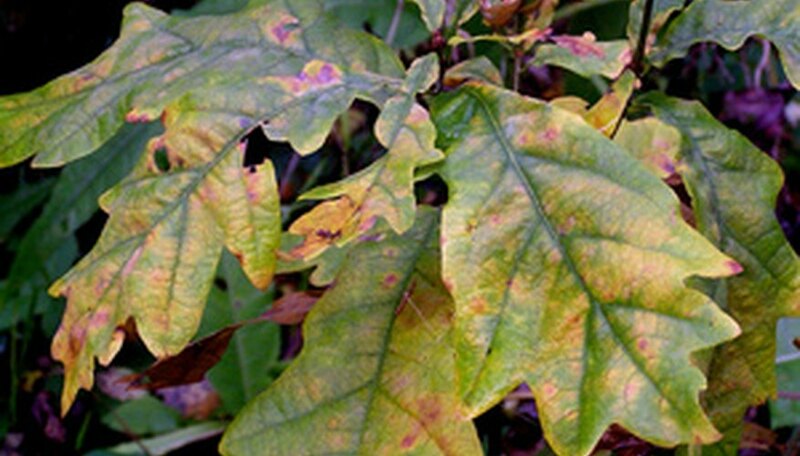 Red oaks are particularly susceptible to oak wilt fungus. The leaves of afflicted trees will lose their color in a few weeks before turning brown or yellow and dropping. Heavily infected trees may develop fungal mats on their bark. There is no cure for this disease. Uproot afflicted trees and dispose of them immediately to prevent spread. Have a professional positively identify your oak tree's fungus before you treat it.